The Opus codec provides superior audio quality over codecs such as AAC, MP3 and Vorbis. Android has support for Opus since Android 5.0 (Lollipop). However, when I tried playing Opus files on My LG G4, it wouldn’t recognize the file as a media file at all. It turns out, that the default .opus extension is not recognized by Android. The workaround is to change the extension to .ogg. Generally speaking, this is technically correct, as most Opus streams are encapsulated by an Ogg container, however, .opus is the recommended extension (but apparently not for Android). This entry was posted in Tips and tagged Android on July 9, 2016 by Guy. I have a Samsung Galaxy S2 using an unrooted stock ROM. Lately, I couldn’t update any of my apps, or install new ones as every time I tried it would complain about Insufficient storage available. This was weird, as according to my phone the apps took less than 600MB and still I barely 200MB of free space in my device memory. This entry was posted in Tips and tagged Android, Galaxy S2 on November 1, 2013 by Guy. Every since I switched back from using CyanogenMod ROM to the official ROM (due to modem problems) I missed some of the custom apps. It turns out to be really install those apps. You just need to download CyanogenMod and extract the relevant APKs from system/app/ and copy over the phone. To install them you’ll need to enable installation of apps from unknown source in Settings->Security. It’s best to get a CyanogenMod version that corresponds to your ROM’s version, but I successfully installed apps also from newer CyanogenMod releases. This entry was posted in Tips and tagged Android, CyanogenMod on October 4, 2013 by Guy. Apparently it’s pretty easy, but there are some pitfalls. The first step is to export the certificate as a DER encoded X.509 certificate. This can be done using Firefox (on a PC) by clicking on the SSL’s lock sign in the address bar, More Information -> View Certificate -> Details -> Export. The exported certificate needs to be saved on the root directory of the internal storage of the phone, with *.cer extension (or *.crt). Other extensions will not work. If you see it, just make sure you are exporting the certificate correctly and saving it at the right place. More details: Work with certificates (Geared towards Galaxy Nexus, but should apply to any Android 4.0 and above. Updated Aug 2015: Fixed a broken link. This entry was posted in Tips and tagged Android, Security, SSL on March 16, 2013 by Guy. 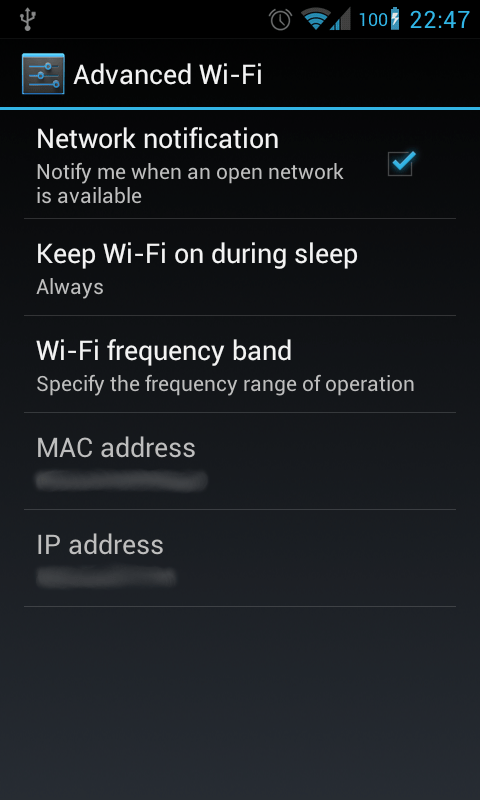 After upgrading to CyanogenMod 9 (ICS 4.0.4) I’ve experience problems connecting to WiFi networks. Most of the time I’ve tried to connect to a WiFi network it would try to connect and then fail. Often it would also show the network I’ve just tried to connect to as “Not in range”. This was extremely irritating, as I could stand by my router and have the phone report that there is no signal, while another Galaxy S2 phone would connect immediately, the only difference was that the other phone was running Android 2.3.7. Needless to say, I haven’t made any major (or minor) changes to my WiFi equipment and the problem wasn’t confined just to my home. Sometimes, it would connect after being idle for a day or so. Back when I was using CyanogenMod 7, I had no problems with the WiFi on my phone, and I could also replicate this behaviour on another Galaxy S2 I’ve upgraded to CyanogenMod 9. Initially I thought it was some bug in CyanogenMod, but I came up with nothing. Over the weekend, I’ve figured maybe the bug isn’t specific to CyanogenMod, and I’ve found this bug report WiFi freeze on Samsung Galaxy S2 with ICS 4.0.3. For some reason many people have problems with WiFi on Galaxy S2 with ICS. While the report relates to the WiFi freezing, which I didn’t experience, I’ve decided to sift through the comments. Some people mentioned the “Wi-Fi frequency band” feature available in Wi-Fi settings -> Advanced (available by pressing the menu button), so I’ve decided to try playing with the different settings there. 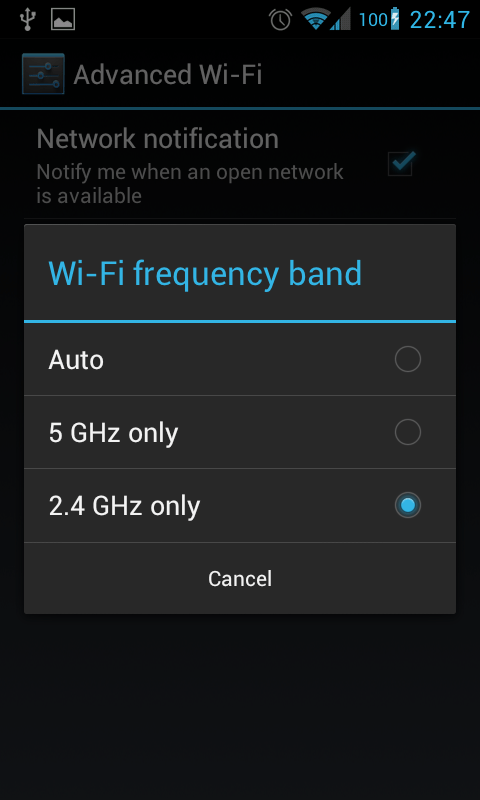 This setting allows you to choose the WiFi operating frequency between three options 5GHz, 2.4GHz and “Auto”, which as you can guess automatically figures out the right frequency, 5GHz (802.11a and 802.11n) and 2.4GHz(802.11b/g/n). However, it seems the phone (probably due to a problem in the driver) fails the “Auto” thing. Instead of guessing the right frequency, it fails to connect. So I’ve changed it to 2.4GHz, which is still more popular choice in routers over 5GHz, and instantly my phone connected to my router. For conclusion: If you have trouble connecting to WiFi on Samsung Galaxy S2 with ICS, you should probably set the phone to use 2GHz only (or 5GHz only) instead of the default “Auto” mode. This entry was posted in Tips and tagged Android on July 22, 2012 by Guy. 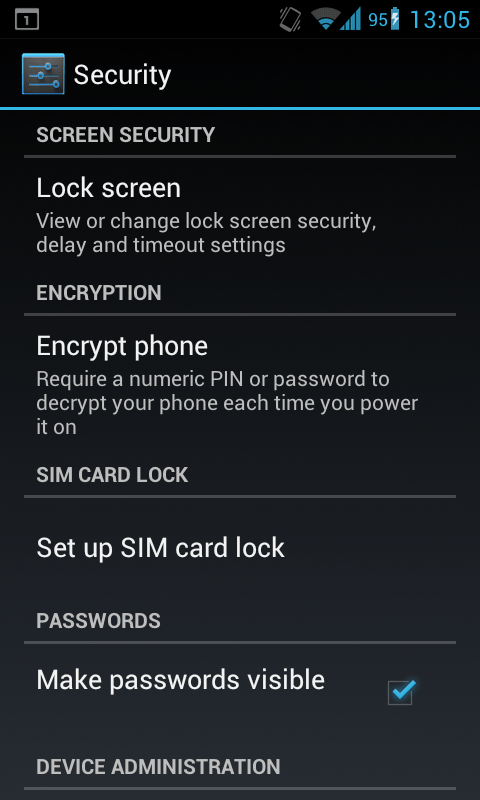 One of the new features touted by ICS is full-disk encryption (actually it was first available in Android 3). The first look is promising. The android developers went with dm-crypt as the underlying transparent disk encryption subsystem, which is the de-facto way to perform full-disk-encryption in Linux nowadays. This ensures both portability of the encrypted file systems and tried-and-tested implementation. The cipher itself is 128-bit AES in a ESSIV mode, and the encryption key is derived from the password using PBKDF2 (actually it’s the key that encrypts the actual encryption key, allowing fast password changes). So where do I think it went wrong? Enabling the full disk encryption. This entry was posted in Uncategorized and tagged Android, Security on June 29, 2012 by Guy.